As of now the Dolphins are not allowing cameras in their War Room. 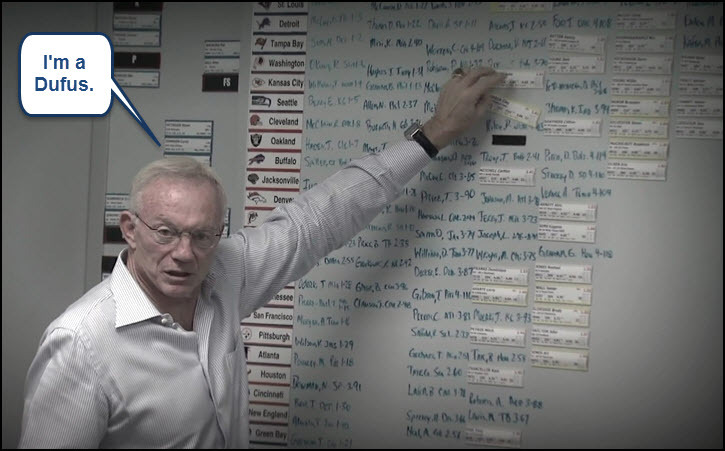 I wonder if the Cowboys will allow their draft board to be shown on TV again ... LOL! The network announced Monday the Vikings will be one of 16 teams that will be covered by cameras in their draft rooms. The others will be Houston, St. Louis, Jacksonville, Atlanta, Buffalo, Tennessee, the New York Giants, Dallas, Arizona, Green Bay, Kansas City, Carolina, Denver, Indianapolis and defending Super Bowl champion Seattle. The Vikings could take a quarterback at No. 8, they could select a defensive player or they could trade down. Or they could do something else. The suspense will be chronicled Thursday for all to see. You guys see that movie? as much as I love the draft the trailer looked stupid to me. But if you say its good I'll give it a try when it hits DVD. Maybe they don't want the world to see them throwing darts at the board. Since we are going to nail this draft I have no problem with not having cameras in the room. No sense in giving away our amazing strategies that Hickey will bring.